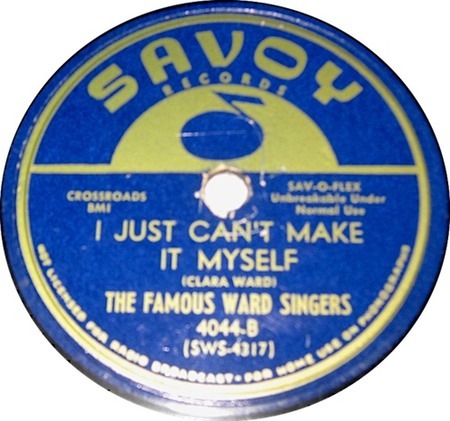 The original recording of "I Just Can't Make It By Myself" by the Famous Ward Singers was released as the B-side of "Since I Found The Light" on Savoy 4044. However, the label showed the title to be "I Just Can't Make It Myself" (note the absence of the word "By," presumably a printing error). The Famous Ward SIngers was a group of female gospel singers, headed by Clara Ward. Clara Ward was born in Philadelphia in the early 1920s (the exact date is unknown and even reports of the year differ). Together with her mother, Gertrude, and sister, Willa, Clara gained attention in the 1943 National Baptist Convention. In 1947, Marion Williams and Henrietta Waddy joined the group to form the Famous Ward Singers. Clara was a flamboyant and charismatic artist and she alienated some gospel fans with her group's high-fashion wigs and gaudy outfits. She went on to form several groups of Clara Ward Singers, most of whom performed without her. Clara Ward died in January 1973.